One of the simplest ways to increase your property’s value—and your amount of outdoor storage space—is to add a utility building to your backyard. There are numerous ways to increase your property’s value. Some people make exterior improvements to their homes by purchasing new siding or a building a deck. Others use extensive landscaping to brighten up their yards, all of which can add up to a costly investment at the end of these home improvement projects. Then, there are those people who have discovered how to easily and affordably add value to their properties by adding a utility storage shed to their backyards. When you purchase a new utility shed for your backyard, you give yourself a good amount of extra square footage for storing lawn and garden equipment, tools, seasonal decorations, sports gear, and other items that simply cannot fit inside of your house. This extra outdoor storage building can even serve as an infamous Man Cave, She Shed, or bonus space where you can install televisions, a bar, workout equipment, garden etc., or even just get together for a brew with friends at the end of a long day. The possibilities of use are truly up to your needs, imagination and can be endless. Adding an outdoor storage shed, gable, or mini barn to your backyard not only gives you extra space for storage or get-togethers with friends, but it can also give your property an extra element of visual intrigue and character. For example, companies like Barnyard Utility Buildings can help you design a customized gable or mini barn that matches the current exterior style of your home. With plenty of construction-grade siding and roofing material options from which you can choose, creating a building that coordinates with your house is hassle-free. Along with choosing siding and shingles that match your home, your gable or mini barn can provide your backyard addition with timeless A-frame rooflines that are often received well among neighborhood home owners’ associations, while adding value to your property. Another way to increase your property’s value with a utility building is adding a porch onto your new or existing structure. A porch provides you with an outdoor space where you can sit and drink your morning coffee while reading a magazine or newspaper. You can even add an overhang to your storage utility building’s porch so you can enjoy the outdoors in both rain and shine. 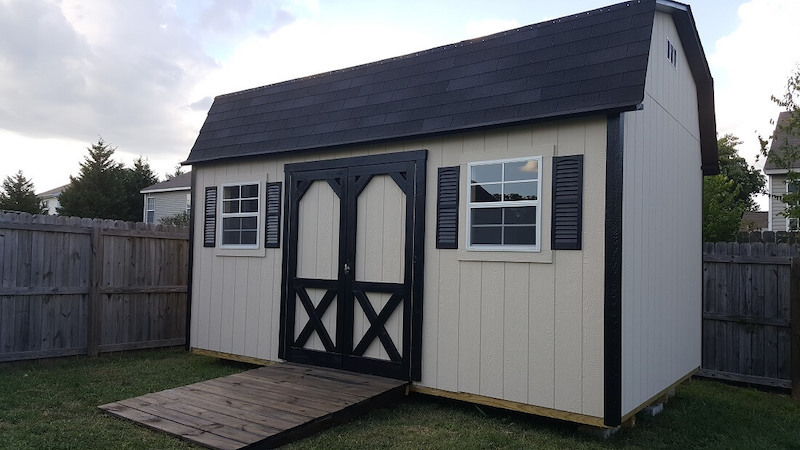 While utility buildings can certainly increase your property value, give you more storage room, and create a visually pleasing focal point in your backyard, there are a few considerations that must be made before purchasing a new storage shed or upgrading an existing structure. First of all, if you live in a suburban neighborhood, you must be sure to notify your home owners’ association to let them that you plan to place a new structure in your backyard. Even if you plan to update an existing utility building’s exterior, you should consult your HOA, as most of these associations have strict regulations or require permits with which you must comply including building color, design, size, and placement in your backyard. Along with following HOA guidelines when adding a utility building to your backyard, you should also check with other city and county governing boards that manage properties to make sure that you have all of the proper building permits. Once, you have the “all clear” from these agencies, you are free to add your utility building to your backyard! In addition to installing your new utility storage building in your backyard, Barnyard Utility Buildings can also help demolish and remove existing structures from your property. If you are in the market to tear down your current outdoor storage building in your backyard in order to make room for your new, updated structure, you can count on our team to guide you through the process and do the heavy lifting. Along with tearing down existing structures and hauling away the debris, our company can also easily relocate most utility storage buildings of a reasonable height up to twelve feet wide. Whether you want to transfer an existing utility shed ten feet away from its current location on your property, or if you have made a move and need to haul a shed from your old house to your new home’s backyard, Barnyard has you covered. Adding value to your property by installing a utility building has never been easier. Barnyard Utility Buildings can help you create a structure that can serve as a focal point for your dream backyard, a Man Cave or She Shed where you and your friends can gather, or simply extra square footage in which you can store miscellaneous items that do not fit in your home or garage. Whether you need to meet HOA requirements, or you desire a specific exterior look, we can help you design your ideal utility shed.